Strict controls introduced for Turkish lemon imports into the European Union last season will remain in place in 2018/19, the European Commission has announced. The Commission said it would maintain the tightened regulations for the coming season, with the aim of ensuring compliance with EU legislation on maximum pesticide residue limits, as it believes they still constitute a risk. As a result, checks will remain in place on a minimum of 10 per cent of batches imported into the EU. During the 2017/18 season, the Commission issued eight health warnings related to an excess of pesticide residues in Turkish lemons, through its Rapid Alert System for Food and Feed (RASFF). As a result a number of batches of Turkish lemons were rejected, prohibiting their entry and sale in the EU. These rejections were due to the detection of residues of chlorpyrifos and imazalil in significantly higher amounts than permitted by the MRLs established in EU regulations. “With these actions, the EU has confirmed the risk status of Turkish lemons and decided to keep its stricter border controls in place,” said Spain’s Ailimpo in a press release. 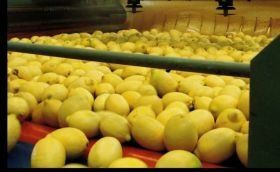 As a result, until at least 31 December 2018, one out of every 10 batches of Turkish lemons exported to the EU will be subject to stricter official controls involving documentary, identity and physical checks and laboratory analysis. In addition the importer/authorised economic operator, or their agent, must give prior notification of the batch, and the estimated date and time of its physical arrival at designated points of entry, which are the only EU customs posts where imports are permitted. This involves the presentation of a completed Common Entry Document – required for entry through EU customs – at least one working day before the physical arrival of each batch of lemons.